Large guided groups. On average, the guided biking tours of other companies will have about 13 people in each group. The guide, of course, should take into consideration the biking pace of the group, but this can differ greatly from the pace at which you personally like to bike. Thus, this could cause you either frustration if they go too slow or unnecessary stress in trying to keep up. Biking at the pace of the guide could be especially difficult for families with children. While the roads are safe to bike on, large biking groups do create an unpopular hindrance for local traffic and thus could pose a greater risk of an accident. Small ‘ride at your own pace’ groups. We started Maui Sunriders with the goal of offering a biking experience that was more accessible to families. Our family has always been active, and we loved biking down Haleakalā with our children. So, we decided to offer a bike tour with greater freedom – one where you can ‘ride at your own pace,’ as we like to say. Whether you want to bike down with your family or with a small group of friends, our self-paced bike tours provide visitors with a more relaxing pace – one more in line with the spirit of aloha. Scheduled guided bike tour stops. Those who enjoy structure may like a guided bike tour down Haleakalā. On a guided tour, the group will have several scheduled stops at scenic photo op points along the bike route. However, these stops are ones that the bike tour guide chooses, and because of time and the group size, the guide will probably limit the stops to only a few of the most popular tourist spots. Many of these guided tours do stop for brunch at a restaurant along the route, but here again, they will stop at a restaurant that the guide chooses. And this brunch may be the only time you get to stop in many of the quaint towns with numerous charming shops along the route. Stop and smell the protea on a self-paced tour. In contrast, on our self-paced bike tours you have the freedom to stop when and where you want to along the route. Enjoy a relaxing ride down Haleakalā where you can stop, admire the beautiful protea flowers, and really take in the experience with a self-paced tour. The beauty of Upcountry Maui is something you shouldn’t have to rush through with a large group. Stop at the Kula Lodge and Restaurant for breakfast and then stop again at the many shops and art galleries in the small towns along the way. The choice is yours with our self-paced bike tours. This relaxed pace is great for those who love to immerse themselves in the experience, those who want to get the photo op no one else got, and those who like to see how the locals live. This self-paced tour is perfect for families or couples who want to enjoy a romantic ride through an unforgettable part of Maui. “Self-paced,” not actually “self-guided” We often refer to our Maui bike tours as self-paced bike rides down Haleakalā instead of describing them as “self-guided.” What is the difference? As you’re driven up the mountain to the summit, our tour guides will point out and thoroughly explain different points of interest along the way. Thus, you are given a guided tour of the bike ride as you drive up, but then you can go at your own pace biking back down. This narrated tour will point out various dining options in the small towns on the route as well as explain the history of the area and interesting facts about Hawaiian culture. With this narrated tour, you’ll know where the best places to stop are along the route, but at the same time, you’ll be able to stop on your own timetable. And while our bike tours are self-paced, your group is not left entirely on its own. Safety is our top priority, and thus we offer prompt roadside assistance. If you need anything on your Haleakalā bike tour, just call us and we’ll be right there to help. So how do you think the different types of bike tours compare? Would you prefer a more relaxed bike ride down Haleakalā where you can stop wherever you’d like along the route on your own timetable or do you like a more structured ride with a larger guided group? 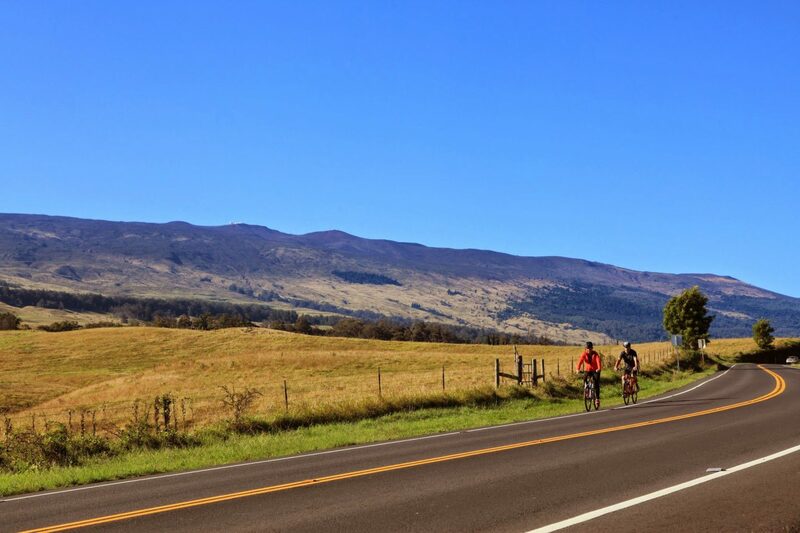 If a relaxed ride with greater freedom is better for your family, then book one of our self-paced bike tours online today and experience the unique beauty of Haleakalā and Upcountry Maui.